Marketing your construction business is vital to keeping your company alive. In today’s business environment when you’re constantly being reminded of the importance of online marketing and lead building, it’s easy to forget that traditional offline marketing still works. Here are three tips you can use for better construction marketing offline—in the real world. Use signage effectively: Have magnetic signs made up that can be applied to the sides of the vehicles used in your daily business activities. The signs should contain your company name and contact information, and perhaps a memorable graphic that illustrates your company. These signs can be easily applied or removed as needed. For dedicated company vehicles, you can have this information permanently applied. Don’t forget to place signs on the fence surrounding any current construction projects. These types of signs tell onlookers who is responsible for the project and helps build an association between your company and real-world construction activities. Apply some nontraditional advertising methods: Newspaper ads, Yellow Pages entries, and billboards can be effective, and you might want to consider them. There are, however, other ways to advertise that are not so common. For example, see if your local grocery store offers advertising space on the back of customer receipts or on shopping carts. Attend networking meetings of local social or service clubs, of Chambers of Commerce, or other organizations to develop business relationships with members who may need your services or know someone who does. 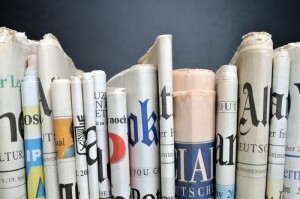 Make yourself newsworthy: Your local newspaper and radio stations are always on the lookout for material they can use to fill their open spaces, so do something newsworthy. Sponsor a local Little League team or charitable event. Send out a press release when one of your employees attains a new credential or is promoted. Promote your contributions to schools, libraries, or other important local organizations. Construction Monitor helps construction companies, contractors and other industry professionals build their businesses with the most recent data and advice. Contact us today for more information on construction marketing techniques, and how to apply these methods to bring in more construction leads.